Photo: Riverlore Mansion, ca. 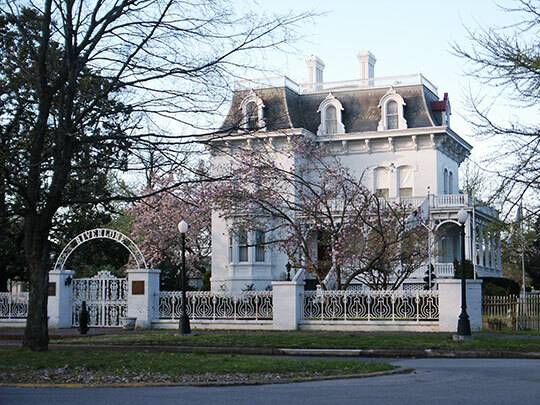 1865, 2723 Washington Avenue (Millionaire's Row), Cairo, IL. Listed on the National Register of Historic Places in 1969. Photographed by User:Oydman (own work), 2005, [cc-by-3.0 (creativecommons.org/licenses/by/3.0)], via Wikimedia Commons, accessed October, 2013. The Alexander County Courthouse is located at 2000 Washington Avenue, Cairo IL 62914; phone: 618-734-7000. Alexander County was formed March 4, 1919 and named for William M. Alexander, an early settler and physician in the town of America, who served as a senator in the 2nd and 3rd General Assemblies.